For other uses, see Candle in the Wind (disambiguation). "Candle in the Wind 1997" is a song by Bernie Taupin and Elton John, a re-written and re-recorded version of their 1974 song "Candle in the Wind". It was released on 13 September 1997 as a tribute single to Diana, Princess of Wales, with the global proceeds from the song going towards Diana's charities. In many countries, it was pressed as a double A-side with "Something About the Way You Look Tonight". The lyrics were written by Bernie Taupin, and the song produced by Sir George Martin. "Something About The Way You Look Tonight"/"Candle in the Wind 1997"
According to the Guinness Book of Records, "Candle in the Wind 1997" is the second highest selling single of all time (behind Bing Crosby's "White Christmas" from 1942), and is the highest-selling single since charts began in the 1950s. After being released, "Candle in the Wind 1997" entered at number one in the UK Singles Chart, John's fourth UK number one single, and became the best-selling single in UK Chart history. In October it became John's ninth U.S. number one single, where it topped the Billboard Hot 100 for 14 weeks, and is the best-selling single in Billboard history; it was the first single certified Diamond in the U.S. The song topped the German Singles Chart for seven weeks, and the Australian ARIA Charts for six weeks it; reached number one in Japan, Canada, France and on music charts around the world. The 1997 version won John the Grammy Award for Best Male Pop Vocal Performance at the 40th Grammy Awards ceremony in 1998. At the 1998 Brit Awards the song was nominated for the Brit Award for Best British Single. The lyrics of the earlier version of "Candle in the Wind", also written by Taupin, were a tribute to Marilyn Monroe. The opening lines of the 1973 version, "Goodbye Norma Jean, though I never knew you at all," were adapted to "Goodbye England's rose, may you ever grow in our hearts." Most of the lyrics were adapted to suit the circumstances of Diana's life and death. On 31 August 1997, Diana, Princess of Wales, died in a car crash in Paris, France. The news shocked Elton John, as he and the Princess were very good friends. Earlier in the summer, he had also lost another good friend, fashion designer Gianni Versace. Pictures depicting Diana appearing to console a distraught John at Versace's funeral were featured prominently in news coverage throughout the world. Bernie Taupin on writing the lyrics for "Candle in the Wind 1997"
To cope with the grief, John wanted to pay a tribute to Diana. He contacted his songwriting partner Bernie Taupin, asking him to revise the lyrics of their 1973 song "Candle in the Wind" to honour her. George Martin was contacted to help produce the song, and added a string quartet (Peter Manning, Keith Pascoe, Levine Andrade, and Andrew Shulman), and woodwind (Pippa Davies, oboe) to help balance the recording. It was recorded at Townhouse Studios in West London. John publicly performed "Candle in the Wind 1997" only once, at the funeral of Diana, Princess of Wales, in Westminster Abbey on 6 September 1997. He continues to sing the original version of the song at his concerts, but has repeatedly turned down requests to perform the revised version, even for the memorial Concert for Diana in July 2007, having vowed never to perform it again unless asked by Diana's sons. The song has never been released (or re-released) on any of his other albums or compilations, not even his 1997 album The Big Picture, nor the 1997 Diana, Princess of Wales: Tribute album (an official 2-CD release sanctioned by Diana's family that included other artists such as Eric Clapton, Paul McCartney, Queen, Celine Dion, and Rod Stewart). The song was included on Diana, Princess of Wales: The BBC Recording of the Funeral Service. The soundtrack was released on September 30, 1997. "Candle in the Wind 1997" was expected to debut high on the charts, due to its tribute to the death of Diana. It became the fastest-selling single in the UK, selling 658,000 copies on its first day of release, and over 1.5 million in its first week. The single remained at number one on the UK Singles Chart for five weeks, and it became the best-selling song in the UK, overtaking the 13-year-old record held by Band Aid's "Do They Know It's Christmas?" It has been certified as the best-selling single of all time in the UK, and has sold 4.94 million copies in the UK as of September 2017. On the Canadian Singles Chart, "Candle in the Wind 1997" / "Something About the Way You Look Tonight" spent three years in the top 20, with 46 non-consecutive weeks at the top spot. However, the song's unusual chart performance in Canada has also been explained as a structural factor, due to the relative lack of CD singles available for sale in Canadian stores. On Canada's RPM Top Singles chart, neither song made it to the top spot, with "Candle" reaching #14 and "Something" peaking at #13 and spending a much longer amount of time in the top 20. In Germany, the song is the 8th best selling pop hymn ever. Having spent six weeks at number one on the ARIA Charts, "Candle in the Wind 1997" is one of the all-time best-selling singles in Australia, being certified 14 times platinum with 56 weeks in the Top 100. According to Musiikkituottajat, the Finnish music industry federation, "Candle in the Wind 1997" is the best-selling single of all time in Finland, with quintuple-platinum sales of over 54,000 copies to date. It is estimated that at the peak of sales, almost six copies of the single were sold per second. In the UK, the single grabbed the number one slot on the first day of its release, with more than 650,000 copies sold in 24 hours, becoming the fastest-selling record of all time in the UK charts. All artist and composer royalties and record company profits were donated to Diana's charities via the Diana, Princess of Wales Memorial Fund. The song has sold over 33 million copies worldwide, which makes it either the best-selling or the second best-selling single worldwide of all time. The confusion and debate on whether John's record is or is not the best-selling single in the world is due to a lack of information on sales for the record's main contender for the number-one spot, Bing Crosby's recording of "White Christmas," because Crosby's recording was released before the advent of the modern-day US and UK singles charts. However, after careful research, Guinness World Records in 2007 concluded that, worldwide, Crosby's recording of "White Christmas" has, in their estimation, sold at least 50 million copies, and that John's recording of "Candle in the Wind" has sold 33 million, making Crosby's recording the best-selling single of all time. However, an update in the 2009 edition of the book decided to further help settle the controversy amicably by naming both John's and Crosby's songs to be "winners" by stating that John's recording is the "best-selling single since UK and US singles charts began in the 1950s," while maintaining that "the best-selling single of all time was released before the first pop charts," and that this distinction belongs to "White Christmas," which it says "was listed as the world's best-selling single in the first-ever Guinness Book of Records (published in 1955) and – remarkably – still retains the title more than 50 years later." In 1997 La Bouche covered "Candle in the Wind 1997" as a bonus track on their album A Moment of Love. ^ a b Elton John: Biography | Rolling Stone Music Rolling Stone "Candle in the Wind 1997," easily became the all-time highest-certified single". ^ a b c Copsey, Rob (19 September 2017). "he UK's Official Chart 'millionaires' revealed". The Official Charts Company. ^ a b c Entertainment BBC | Entertainment: Elton's candle burns in Canada BBC News "In the UK the song, which Sir Elton performed at the Diana's funeral on 6 September 1997, became the fastest-selling record of all time"
^ a b "The songwriters idea book". Writer's Digest Books p.103. I thought it was very important to project it from a nation's standpoint. I wanted to make it sound like a country singing it. From the first couple of lines i wrote [which began "Goodbye England's Rose"], the rest sort of fell into place. ^ a b c d e Doyle, Jack (26 April 2008). "Candle in the Wind, 1973 & 1997". PopHistoryDig.com. Retrieved 2014-02-14. ^ Paul Grein (3 January 2013). "Chart Watch Extra: Top Songs of 2012". Chart Watch. Yahoo Music. Retrieved 5 January 2013. ^ "CANADIAN BILLBOARD WEEKLY DIGITAL SONG SALES CHARTS FROM 1997". Retrieved 7 December 2017. ^ a b "CANADIAN WEEKLY SINGLE CHARTS (RPM) FROM 1997". Retrieved 7 December 2017. "Kaikkien aikojen myydyimmät ulkomaiset singlet" (in Finnish). Musiikkituottajat – IFPI Finland. Retrieved 21 April 2014. "Kaikkien aikojen myydyimmät kotimaiset singlet" (in Finnish). Musiikkituottajat – IFPI Finland. Retrieved 21 April 2014. ^ "Australian-charts.com – Elton John – Something About The Way You Look Tonight / Candle In The Wind 1997". ARIA Top 50 Singles. Retrieved 2 July 2011. ^ "Austriancharts.at – Elton John – Something About The Way You Look Tonight / Candle In The Wind 1997" (in German). Ö3 Austria Top 40. Retrieved 2 July 2011. ^ "Ultratop.be – Elton John – Something About The Way You Look Tonight / Candle In The Wind 1997" (in Dutch). Ultratop 50. Retrieved 2 July 2011. ^ "Ultratop.be – Elton John – Something About The Way You Look Tonight / Candle In The Wind 1997" (in French). Ultratop 50. Retrieved 2 July 2011. ^ "Elton John Chart History (Canadian Digital Songs)". Billboard. Retrieved February 14, 2019. ^ "Hits of the World: Denmark". Billboard. Nielsen Business Media: 61. 11 October 1997. Retrieved 2014-02-14. ^ "Music & Media: Eurochart Hot 100" (PDF). Music & Media. Retrieved 2018-06-21. ^ "IFPI - Elton John: Something About The Way You Look Tonight/Candle In The Wind '97". Suomen virallinen lista. Suomen virallinen lista. October 1997. Retrieved 2016-11-02. ^ "Lescharts.com – Elton John – Something About The Way You Look Tonight / Candle In The Wind 1997" (in French). Les classement single. Retrieved 2 July 2011. ^ "Offiziellecharts.de – John, Elton – Something About The Way You Look Tonight / Candle In The Wind 1997". GfK Entertainment Charts. Retrieved 2 July 2011. ^ "Top 10 Hungary" (PDF). Music & Media. Retrieved 4 May 2018. ^ "Íslenski Listinn NR. 221 Vikuna 15.5. '97 - 21.5. '97" (PDF). Dagblaðið Vísir. 26 September 1997. p. 22. Retrieved 10 April 2018. ^ "The Irish Charts – Search Results – Elton John". Irish Singles Chart. Retrieved 2 July 2011. ^ a b "Hit Parade Italia – Top Annuali Single: 1997" (in Italian). Hit Parade Italia. Retrieved 2015-08-03. ^ "Nederlandse Top 40 – week 39, 1997" (in Dutch). Dutch Top 40 Retrieved 2 July 2011. ^ "Dutchcharts.nl – Elton John – Something About The Way You Look Tonight / Candle In The Wind 1997" (in Dutch). Single Top 100. Retrieved 2 July 2011. ^ "Charts.nz – Elton John – Something About The Way You Look Tonight / Candle In The Wind 1997". Top 40 Singles. Retrieved 2 July 2011. 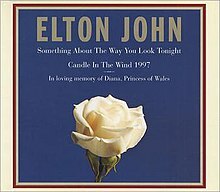 ^ "Norwegiancharts.com – Elton John – Something About The Way You Look Tonight / Candle In The Wind 1997". VG-lista. Retrieved 2 July 2011. ^ "Notowanie nr817". LP3 (in Polish). 26 September 2019. Retrieved 14 February 2019. ^ "Official Scottish Singles Sales Chart Top 100". Official Charts Company. Retrieved 14 February 2019. ^ "Swedishcharts.com – Elton John – Something About The Way You Look Tonight / Candle In The Wind 1997". Singles Top 100. Retrieved 2 July 2011. ^ "Swisscharts.com – Elton John – Something About The Way You Look Tonight / Candle In The Wind 1997". Swiss Singles Chart. Retrieved 2 July 2011. ^ "Official Singles Chart Top 100". Official Charts Company. Retrieved 14 February 2019. ^ "Elton John Chart History (Hot 100)". Billboard. Retrieved 2015-08-03. ^ "Elton John Chart History (Adult Pop Songs)". Billboard. Retrieved 2015-08-03. ^ "Elton John Chart History (Pop Songs)". Billboard. Retrieved 2015-08-03. ^ "End Of Year Charts – Top 100 Singles 1997". ARIA Charts. Archived from the original on 12 September 2009. Retrieved 2015-08-03. ^ "Hits 1997 Österreich – Single-Charts" (in German). Chartsurfer.de. Retrieved 2015-08-03. ^ "ULTRATOP BELGIAN CHARTS (1997)". Ultratop (in Dutch). Ultratop.be. Retrieved 2015-08-03. ^ "ULTRATOP BELGIAN CHARTS (1997)". Ultratop (in French). Ultratop.be. Retrieved 2015-08-03. ^ "RPM '97 Year End Top 100 Hit Tracks". RPM. Library and Archives Canada. Retrieved 5 July 2018. ^ "Hits 1997 Finnland – Single-Charts" (in German). Chartsurfer.de. Retrieved 2015-08-03. ^ "Classement Singles - année 1997" (in French). Archived from the original on 11 October 2012. Retrieved 22 January 2019. ^ "Top 100 Single – Jahrescharts". GfK Entertainment (in German). offiziellecharts.de. Retrieved July 15, 2015. ^ "Dutch Charts - dutchcharts.nl". MegaCharts (in Dutch). Dutchcharts.nl. Archived from the original on 15 March 2015. Retrieved 2015-08-03. ^ "Top Selling Singles of 1997". The Official New Zealand Music Chart. Retrieved 2015-08-03. ^ "Hits 1997 Norwegen – Single-Charts" (in German). Chartsurfer.de. Retrieved 2015-08-03. ^ "Romanian Top 100: Top of the Year 1997" (in Romanian). Romanian Top 100. Archived from the original on September 22, 2005. Retrieved September 19, 2017. ^ "Hits 1997 Schweiz – Single-Charts" (in German). Chartsurfer.de. Retrieved 2015-08-03. ^ "UK's million-selling singles: the full list". The Guardian. Retrieved 24 August 2015. ^ "Billboard Top 100 – 1997". Archived from the original on 11 June 2009. Retrieved 2014-02-14. ^ "Hits 1998 Österreich – Single-Charts" (in German). Chartsurfer.de. Retrieved 2015-08-03. ^ "Hits 1998 Finnland – Single-Charts" (in German). Chartsurfer.de. Retrieved 2015-08-03. ^ "Hits 1998 Norwegen – Single-Charts" (in German). Chartsurfer.de. Retrieved 2015-08-03. ^ "Hits 1998 Schweiz – Single-Charts" (in German). Chartsurfer.de. Retrieved 2015-08-03. ^ "Hits 1998 UK – Single-Charts" (in German). Chartsurfer.de. Retrieved 2015-08-03. ^ "Billboard Top 100 – 1998". Archived from the original on 9 March 2009. Retrieved 2014-02-14. ^ "Top 20 of All Time". Retrieved 5 July 2018. ^ "The UK's biggest selling singles of all time". Official Charts Company. Retrieved 5 July 2018. ^ "The Billboard Hot 100 All-Time Top Songs (50-41)". Nielsen Business Media, Inc. Retrieved 2018-08-01. ^ "ARIA Charts – Accreditations – 1997 Singles". Australian Recording Industry Association. Retrieved 28 June 2010. ^ "Austrian single certifications – Elton John – Candle in the Wind" (in German). IFPI Austria. Retrieved 28 June 2010. Enter Elton John in the field Interpret. Enter Candle in the Wind in the field Titel. Select single in the field Format. Click Suchen. ^ "Ultratop − Goud en Platina – singles 1997". Ultratop. Hung Medien. ^ "Brazilian single certifications – Elton John – Candle in the Wind" (in Portuguese). Associação Brasileira dos Produtores de Discos. Retrieved 2 July 2011. ^ "Canadian single certifications – Elton John – Candle in the Wind". Music Canada. Retrieved 27 October 2011. ^ a b "Elton John" (in Finnish). Musiikkituottajat – IFPI Finland. Retrieved 2 July 2011. ^ "Les Meilleures Ventes Tout Temps de 45 T. / Singles" (in French). Infodisc.fr. Archived from the original on 30 October 2011. Retrieved 30 October 2011. ^ "French single certifications – Elton John – Candle in the Wind" (in French). Syndicat National de l'Édition Phonographique. Retrieved 28 July 2010. ^ "Gold-/Platin-Datenbank (Elton John; 'Candle in the Wind')" (in German). Bundesverband Musikindustrie. Retrieved 28 July 2010. ^ "The Record > February 2001" (PDF). Recording Industry Association of Japan (in Japanese). Archived from the original (PDF) on 16 January 2014. Retrieved 2013-07-16. ^ "Dutch single certifications – Elton John – Candle in the Wind" (in Dutch). Nederlandse Vereniging van Producenten en Importeurs van beeld- en geluidsdragers. Retrieved 2 July 2011. Enter Candle in the Wind in the "Artiest of titel" box. ^ "Latest Gold / Platinum Singles". Radioscope. 17 July 2011. Archived from the original on 2011-07-24. Retrieved 2 July 2011. ^ "Norwegian single certifications – Elton John – Candle in the wind" (in Norwegian). IFPI Norway. Archived from the original on 5 November 2012. Retrieved 19 June 2013. ^ "Polish single certifications – Elton John – Candle in the Wind" (in Polish). Polish Society of the Phonographic Industry. ^ "Spanish single certifications – Elton John – Candle in the Wind" (PDF) (in Spanish). Productores de Música de España. Retrieved 2 July 2011. Select single under "Chart", enter the certification year in the field "Year". Select the certification week in the field "Semana". Click on "Search Charts". ^ "The Official Swiss Charts and Music Community: Awards (Elton John; 'Candle in the Wind')". IFPI Switzerland. Hung Medien. Retrieved 2 July 2011. ^ "British single certifications – Elton John – Candle in the Wind". British Phonographic Industry. Retrieved 2 July 2011. Select singles in the Format field. Select Platinum in the Certification field. Type Candle in the Wind in the "Search BPI Awards" field and then press Enter. ^ "American single certifications – Elton John – Candle in the Wind". Recording Industry Association of America. Retrieved 2 June 2015. If necessary, click Advanced, then click Format, then select Single, then click SEARCH.